“Being a maker is about having an attitude,” remarked Peggy Reimers (shown left) during a workshop. A reluctant convert to 3D printing, I had often asked myself the question “Why make stuff when you can just order it on Amazon?” That was before I realized how important it is to own again the experience of “making” things, as well as “programming” things. And that idea certainly connects to having the right attitude. As Peggy points out, we need to cultivate a maker’s attitude towards teaching and learning. A willingness to blend high-tech with hand-made crafts: Often, there is a bias against hand-made crafts, the work we do with our hands. But this bias poorly reflects the reality. Plumbers, electricians, drone handlers, and 3D printing experts make money with this work, often more than those who have earned a college degree. What happens when you combine high-tech with crafts? The power is in designing in one medium (e.g. by hand or digital), then creating in the other. For example, designing a dragon’s head (as Filemon Aldama demonstrates in the image slideshow shown right), then digitizing the physical construction and printing it in 3D. A willingness to FAIL (First Attempt in Learning): To innovate faster, you have to explore as many paths towards success as you can. While the number of failures increases, so do the opportunities for success. Children know this intuitively; they suffer no loss of face or shame when they fail. As they grow older, though, their fear of failure, of the stigma of missing the mark set by others, mounts until they will do nothing except that which results in success. In some ways, they settle for “success” rather than the “Success” they crave desperately. A willingness to grow into expertise: It is so easy, when encountering obstacles, to stop moving forward, to shut down and not ask for help. The Internet, however, takes that shame and provides an avenue for those afraid to ask for face-to-face help to now learn virtually, 24 hours a day, seven days a week. This means that those with a maker attitude are able to grow slowly, nurtured by a steady stream of videos that help them find their own way to the goal, and accept assistance from online strangers. They find their own path, eschewing the expectation that their every creation look like the factory model that once served as the de facto standard for mass production. Technology makes the mass production of the unique a new standard. This maker attitude should be readily embraced by teachers who have been forced to lay aside the craft of teaching to engage in formulaic teaching to prepare students for success on high stakes tests. When I served as a teacher, designing a lesson was an act of making. Dr. Judi Harris referred to it as a process of reinvention, adapting another teachers’ lesson plan for one’s own to meet the needs of students, matching our individual style. In a very real sense, teachers re-invented the wheel for lesson plans. The threat and challenge of digitized curriculum, high-stakes testing threatens the craft of teaching and learning. In a way, the maker movement serves as an outlet to every human’s fundamental need and desire to manifest our uniqueness. 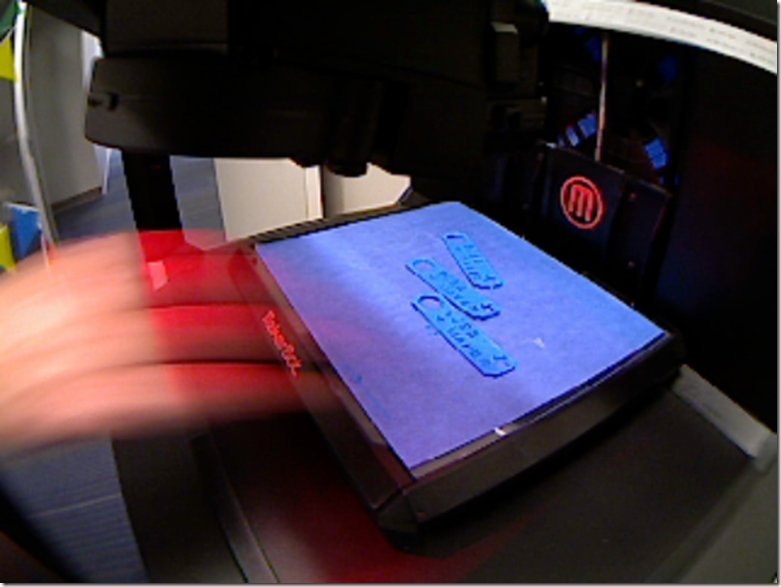 When loading my first design into MakerBot desktop software, it made some adjustments. That helped me realize that my first design was far from perfect. “With 3D printing, there is no limit to what you can build, and it is this design freedom which makes the technology so exciting by bringing to life what was previously considered to be impossible. This landmark technology allows us as designers to innovate faster and create personalized, ready-to-wear fashion in a digital world with no geometrical constraints and almost zero waste material. We envisage that with further development of the technology, we could 3D print a garment within 24 hours” (source: Science Daily). In order to create, the student must understand concepts deeply. I wanted to harness the interest in 3D printing and see where it could take us as creators. Where can 3D printing take us as creators? For me, it takes us down a path that builds confidence and helps me develop experience in something that perhaps, I have failed at, but may succeed if I continue. “Take risks,” shared Christy Cate (ESC-14, @christycate) at the first-ever TCEA Makers event held on May 24, 2016. If there was one take-away, that was it. Amazingly, it’s the same advice offered by Allison Starling at St. Gabriel’s Catholic School in Austin, Texas. Be sure to tune-in to a future podcast to hear them both share their insights!